Nissan Motor Co's new Leaf, the latest version of the world's top selling electric vehicle (EV), is seen during its world premiere in Chiba, Japan, September 6, 2017. CHIBA, Japan - Nissan Motor Co Ltd will launch a revamped version of its Leaf electric vehicle (EV) on Wednesday, going head-to-head with Tesla Inc’s Model 3 and beating off criticism that a limited driving range will dull its mass-market appeal. The new Leaf, on sale in Japan from Oct. 2 and elsewhere early next year, has a range of about 150 miles (241 kilometers) on a single charge according to U.S. environmental regulator estimates, up from its predecessor’s 107 miles thanks to a bigger, 40 kilowatt hour battery. Nissan has also given its marquee electric model a sporty facelift and a price tag starting at 3.15 million yen ($28,992.18), and packed it with the latest automated functions including single-lane highway driving and self-parking. But for all the improvements, analysts said the range afforded by the Leaf and other EVs remains insufficient to lure many drivers away from regular cars, particularly in the U.S. where gasoline prices are historically low, limiting the appeal of EVs to affluent, environment-conscious drivers. “Until we see a significant improvement in range and/or economics that feed through to a rise in gasoline prices, EV buyers will be buying for environmental or altruistic reasons,” said Janet Lewis, head of Asia transportation research at Macquarie Securities. Industry experts said a range of around 250 miles or more at a price of around $30,000 would be needed to see a significant shift to EVs targeting the mass market. The Leaf’s range is short of the 220 miles of the base version of Tesla’s Model 3, the luxury electric automaker’s first foray into more affordable cars, which launched in July with a starting price of $35,000. General Motors Co’s Bolt, released last year, runs for about 283 miles and has a price tag of around $37,000. 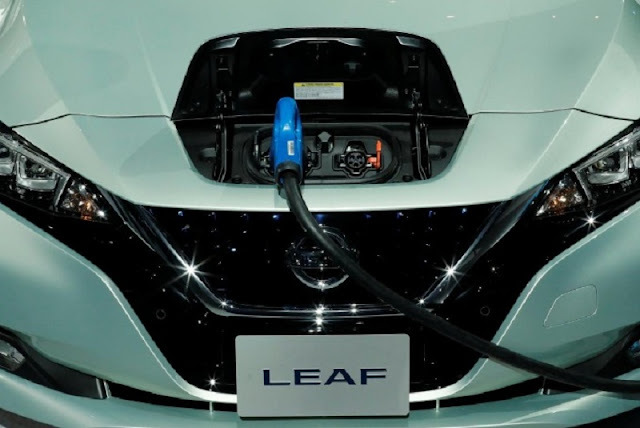 Nissan was one of the first automakers to market an EV to the masses when it launched the first Leaf in 2010, helping the Leaf become the world’s biggest-selling, all-battery car. The Leaf and the Zoe, its sister model developed by alliance partner Renault SA, dominate the global mid-sized EV market in cumulative sales, but industry experts said the Model 3 will highlight the Leaf’s shorter range. As Tesla has entered the mid-sized EV market, “Nissan will have to compete on functions other than battery range, like automated functions” to stay on top of the market, said Takeshi Miyao, managing director of consultancy Carnorama. Just over 2 million EVs were registered worldwide as of 2016, according to the International Energy Agency, comprising a sliver of the more than 80 million vehicles sold last year. To date, Nissan has sold 280,000 Leafs since its launch in 2010, while the Zoe has sold 80,000 units since launching in 2012.